This may be the shortest review I have ever written…we will see…because to say anything about this book would be a spoiler and this is definitely a book that you need to go into totally blind. 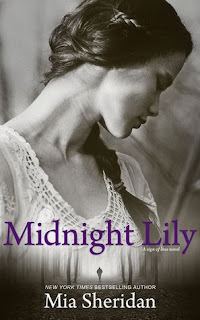 Midnight Lily is unlike anything Mia has written before, this is like a romantic suspense type read whereby you will be trying to read between the lines, looking for clues, looking for anything that makes you understand what is going on. What is real? What is not? Is everything as it seems? To say I was shocked while reading would be an understatement, as the story panned out over the pages I was like wow Mia, totally unexpected, totally blind sided and where the hell did this come from? This goes to show how versatile Mia Sheridan is, no matter the subject or genre she always delivers. Mia Sheridan’s signature story telling is prevalent throughout as she whisks you away into the lives of Holden and Lily. Visceral scene setting will have you running through forests on this enchanting journey of two characters that were battling to find themselves in a world that had dealt them a bad hand and seemingly had no intention of giving them a break. A haunting tale of finding love and friendship when you most need it. My emotions were on overload while reading, my heart broke for these two characters as Mia Sheridan delivered their story with evocative words and with heart breaking clarity. Two decimated souls that gravitated together when the world was telling them to stay worlds apart. The unlikeliest of love stories yet one that was born from sincerity, friendship, trust and hope. This was one intense read, with twists and turns and masterful trickery, but is a read that I will not be forgetting in a hurry. As usual Mia Sheridan will embed her characters into your heart and soul as you cannot help but be enamoured by their past, their present and their future. Such an amazing and thought provoking book, go in blind and enjoy the ride.